Here’s Basketball (by developers Lucky Game). We actually got recommended a different app in to try from them but they do have a bunch of really quite some fun and worthwhile download games (which you’ll be notified every now and again during the game). Anyway, you’re basically shooting some hoops like you might find yourself in some arcades. There are four balls (you can’t steal any from the next station :p) and you flick the ball to the basket. You have to wait till they end up on your side (you can’t grab them too early either). There are different levels, the basket might be further or it might move. I don’t know exactly how many levels, I think I got to 7 (you have to meet a certain quota in the time limit). The game is more fluid than what the video shows. BTW, Kudos to the developer who made the ads unobtrusive and non obstructing to the game (only appearing occasionally). 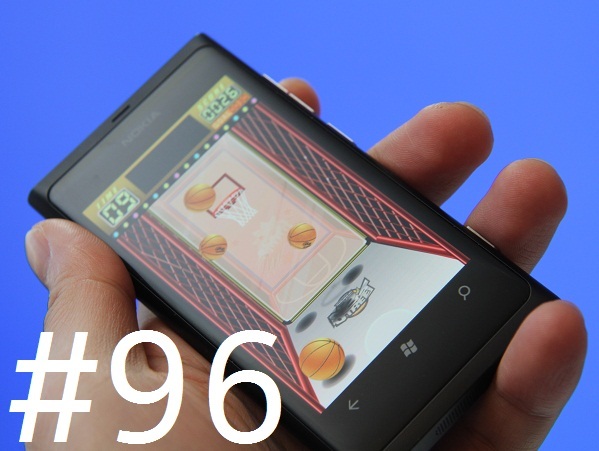 The best basketball for windows phone here! Any feedback please email us, because we can’t reply on comments. Thanks very much for all your support in our games! Wow! So addictive and thrilling! With awesome vivid sound and extremely super cool designed graphics, this classic basketball shot game gives you fantastic challenges, but simple as well as fun. Ordinary 2 points mode、moving basket mode and 3 points mode are all designed in different levels. After each level up, the game’s difficulty will add, witch makes it most exciting and crazy! Touch and fling a ball towards the basket, control the direction of the fling to make a perfect shoot accurately. Be quick! Shoot as many balls as possible in a limited time to get the higher score. Coordinating your hands and eyes, you may be the lightning fastest! – Let any shots in the air count even if its at the buzzer. Thanks a lot for Player220258962’s suggestion. – UI improvement, gives you a better game experience. – Save the setting after restarting game.